Microsoft has added one of the most wanted feature in Windows 8, that’s taking screenshot of the screen or desktop. 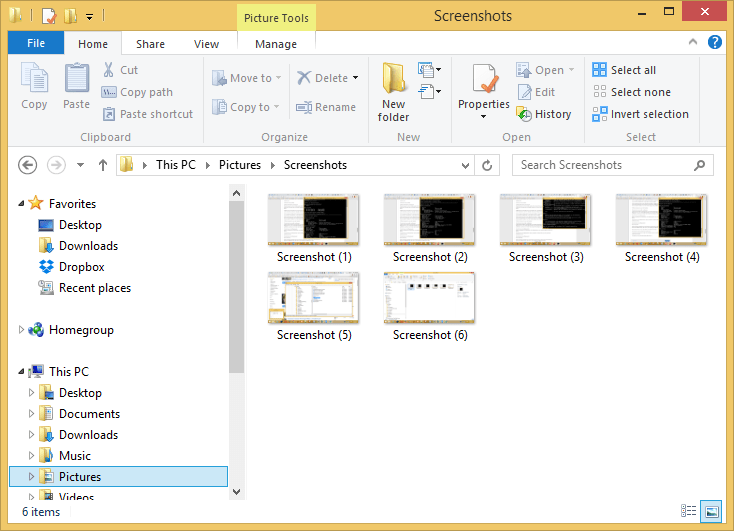 The screenshot feature allows users to quickly and easily snap the screenshot and save as an image on local disk, without using any third-party app or utility. Screenshot feature has been very common among smartphones and tablets running iOS (iPhone and iPad) and Android OS. From Windows 8, including Windows 8.1, Windows 10 or later and their server equivalent, simply press Win + PrintScreen (PrtSc) keyboard shortcuts to activate screenshot feature to capture everything on the screen when the keys were pressed. All screenshot is saved as a PNG image at %UserProfile%\Pictures\Screenshots folder. The image files are named sequentially as ‘Screenshot (#).png’ where # is an incremental number starting from 1 which indicates the screenshot index. The sequential index number for the screenshot does not reset if you delete last captured screenshots, and it does not go back and start over at 1 even if you remove all the screenshot images. The new screenshot will continue to have higher number in its file name. If you want the index number in new screenshot file name to begin or continue from a different number, or you want to reset the counter to 0 or 1 after deleting all photos inside the Screenshot folder, here’s how to change or reset the screenshot index number that will be used for next screenshot taken. 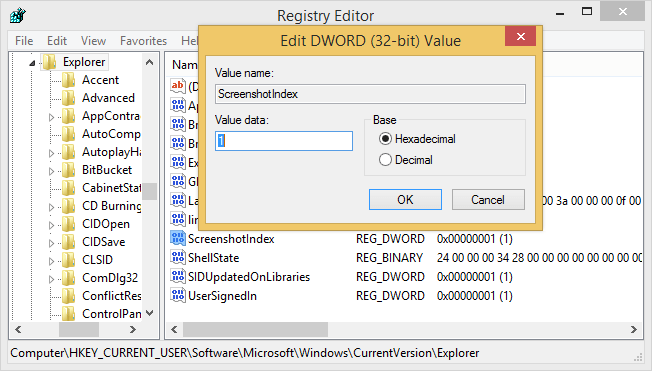 Open Registry Editor (press Win + R and enter RegEdit). Look for a DWORD value named ScreenshotIndex. ScreenshotIndex stores the next number to be appended to the screenshot’s file name. For example, if you have took 10 screenshots, the ScreenshotIndex value date will be “11”, which will make the next screenshot file name to be “Screenshot (11).png”. Double click on “ScreenshotIndex” to make the change. You can set the counter value to 1 to reset the screenshot numbering to begin again from 1. If you still have some photos inside the Screenshot folder, Windows is smart enough to skip the numbers which have been used. For example, there are files named “Screenshot (1).png” and “Screenshot (3).png” already existed, the new screenshots taken will be named “Screenshot (2).png”, “Screenshot (4).png”, “Screenshot (5).png” and so on. In other words, Windows does not overwrite existing files. It’s not necessary that you must make the index number sequence to start from 1. If you prefer, you can set the screenshot index to start from any number series, e.g. from 100 or 1000 onwards. But do note that the default selection for DWORD value is hexadecimal, remember to change it to decimal before entering your digits greater than 10.